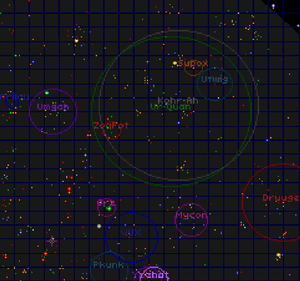 Image 1: Starmap in 2155. Image 2: Starmap in 2158 showing Spheres of Influence. The Starmap, or star chart, is the map of our corner of the galaxy and is used for navigating via Hyperspace between destinations in TrueSpace. It is divided into a grid of 20x20 squares, with each square consisting of fifty degrees space-latitude by fifty degrees space-longitude. The canonical term Standard HyperSpace distance unit, (or SDU) is used to describe the degrees of distance in latitude and longitude. 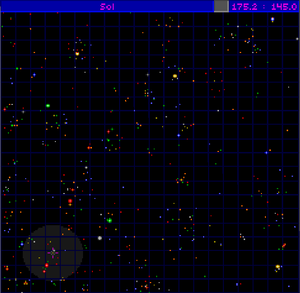 The section of space shown on the Starmap is 1000x1000 SDU and 1000000 square SDU. While viewing the map, the lowest X:Y co-ordinate is (002.0 : 002.1) and the highest is (999.9 : 997.7). The imaginary line connecting the two points is the Coreward direction and travel between the two points requires 141.3 units of fuel for the Flagship. In HyperSpace, the Flagship can travel to the co-ordinates (000.0 : 000.0) and (999.9 : 999.9) which will be shown in the navbox, but the ship's location on the Starmap will be (002.1 : 002.1) and (999.9 : 997.7) respectively. On the Starmap, the location of The Flagship is designated by a small grey ring and its selected destination by a pink compass star; the trajectory between the two points is represented as a dotted blue line. The projected fuel consumption is shown in the menu column. While plotting course, the Flagship's possible range, based on how much fuel is in the tank, will be expressed as a grey disc on the map. When the Flagship makes contact with a race, their Sphere of Influence is added to the Starmap in the form of a coloured ring with their name in the centre that corresponds to the location of their fleet (Image 2). Image 3: Navigation mode in main screen, showing the Flagship in HyperSpace with small green navbox showing Flagship's relative location. 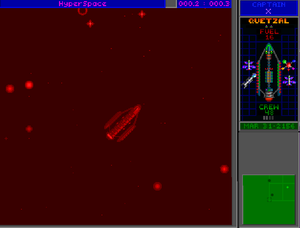 In Navigation mode (Image 3), the main screen shows the Flagship's location, and to the right is a smaller, green navbox that shows the Flagship's immediate position with nearby stars and any approaching vessels. To travel the entire length of one axis (ex: from the top left of the map to the top right) requires exactly 100.0 units of fuel. To travel a diagonal line between corners (ex: from top left to bottom right) requires 141.3 units of fuel. 1 SDU uses 0.1 unit of fuel. Many Humans use the cardinal points to refer to relative locations on the starmap, with the top of the map being north. The north-south axis runs from (500.0 : 999.9) to (500.0 : 000.0). The west-east axis runs from (000.0 : 500.0) to (999.9 : 500.0). By this system, Human, Ilwrath and Pkunk space are all in the southwest of the region while the Supox and Utwig are in the northeast. Gamma Cancri (500.6 : 501.1) is the closest star to the centre of the map and it falls within Kzer-Za and Kohr-Ah space. 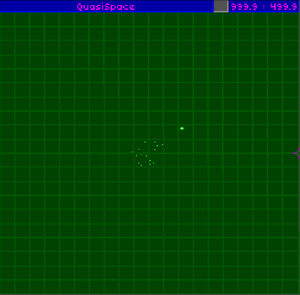 QuasiSpace is to Hyperspace what HyperSpace is to TrueSpace. While the Flagship is travelling thru QuasiSpace, a different QuasiSpace Starmap (image 4) is used, one that shows only the naturally occurring exit portholes to return to HyperSpace. Navigation is in mirror image to the HyperSpace/TrueSpace chart, such that the cardinal points are reversed. This page was last edited on 19 March 2019, at 12:27.